BMW M5 Sedan is a D+ segment luxury car. The car has captured the attention of Indian car lovers and surely has a great future in India. Appearance: BMW M5 Sedan comes in six beautiful colors – Black Sapphire, Interlagos Blue, Silverstone II, Indianapolis Red, Alpine White and Monaco Blue. The frontage consists of double-kidney shaped front grille and broad and adjustable xenon headlamps and fog lights. The rear portion comprises of four chrome plated steel exhaust pipes and sleek taillights. The alloy wheels give a sturdy look to the car. Comfort: BMW M5 Sedan has various comfort features. The car has Adjustable Seats, Power Steering, Adjustable Steering Column, Power Windows (front and rear), Automatic Climate Control, Air Quality Control, Remote Trunk Opener, Remote Fuel Lid Opener, Low Fuel Warning Light, Accessory Power Outlet, Trunk Light and Vanity Mirror. Other comfort features include Leather Wrapped Multi Function Steering Wheel, Height Adjustable Front Seat Belts, Cup Holders-Front, Rear Seat Headrest, Rear Reading Lamp and Rear Seat Centre Arm Rest. BMW M5 Sedan is fitted with powerful A.C., Heater, Hi-tech Audio System with remote control, Glove Compartment, Digital Clock, Key less Entry, Cigarette Lighter and Digital Odometer. Safety: BMW M5 Sedan has advanced safety features. The car has Driver Airbag, Passenger Airbag, Side Airbag, Seat belts, Seat Belt Pretensioners, Anti-Lock Braking System (ABS), Brake Assist, Anti Theft Alarm, Seat Belt Warning, Door Ajar Warning Child Safety Door Locks, Power Door Locks, Central Locking System and Engine Immobilizer. Other safety features include Collapsible Steering Column, Side Impact Beams, Front Impact Beams and Deformation Zones on front and rear bumpers. BMW M5 Sedan has Vehicle Stability Control System, Electric Damper Control (EDC), Crash Sensor and Engine Check Warning. Engine: BMW M5 Sedan has 5.0L, 507bhp,V-10 petrol engine which generates a maximum power of 373 kW at 7750 rpm and a maximum torque of 520 Nm at 6100 rpm. The engine is linked to 7-speed M Drive Logic Sequential Manual Gearbox (SMG). The emission norms are Euro IV compliant. 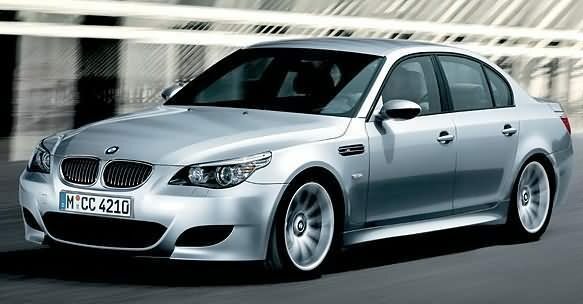 Price: The price of BMW M5 Sedan is Rs.1,01,50,000. However, the price specified is approximate price which excludes tax, registration, insurance and cost of accessories.